So the day didn’t get off to a good start really. Friday sees me paying some regular bills and moving some money around. Not an issue, I can easily check the payments using the Santander iPad/iPhone app. Easy. However, the problem comes in when I try and add it to my financial records. I keep these in GNUCash and with no iPad app, I’m stuck having to use the main desktop to enter the details in. 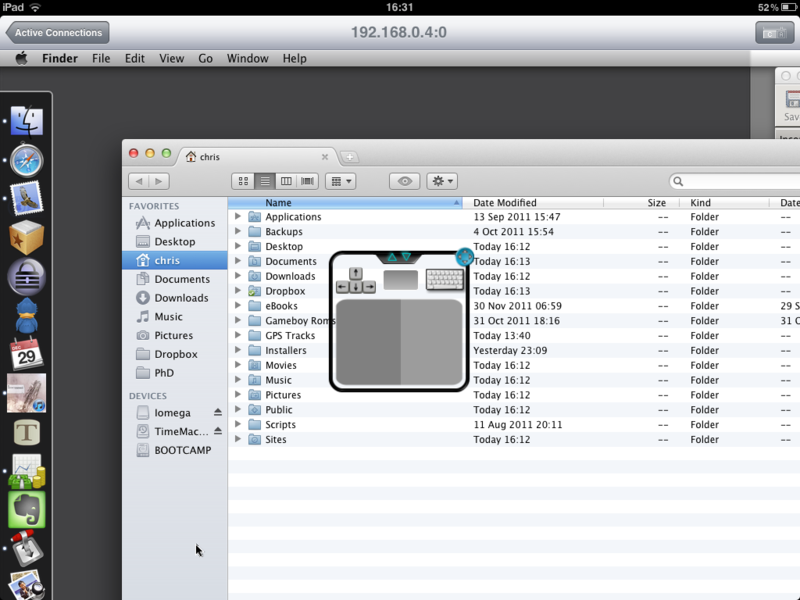 Easily done using the iSSH app which let me log into my home Mac, open up GNUCash and enter the details. I found the bluetooth keyboard to actually be a hinderace at this point – using the onboard keyboard was much easier. Once that was done, it was time to log off and head to work. So getting into work, it was pretty amazing to just get out the iPad, stand and keyboard – the whole affair was small and tidy, compared to my usual Macbook, mouse, hard drives, cables everywhere and paper and pen. This seemed much tidier than normal, possibly due to the fact the keyboard was the only accessory I had out and that’s wireless (bluetooth), compared to my mouse and charging cables. Once that was all sorted, I started the Textastic app and got down to work. 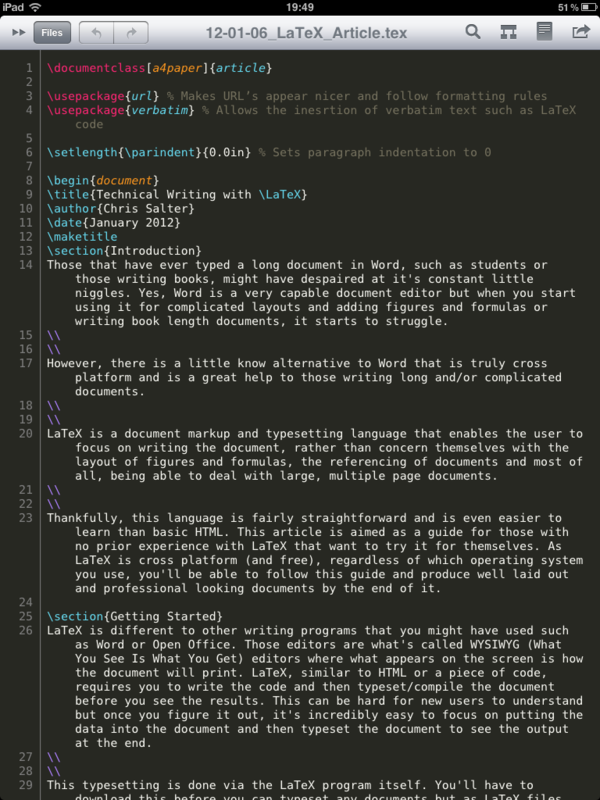 Textastic is a great app, with Dropbox and FTP functionality built in, meaning that I could easily connect to Dropbox, and download my LaTeX code to get working on my thesis. I prefer Textastc over other apps because it has this functionality built in and it support LaTeX syntax highlighting which is a great help (it also supports TextExpander snippets which I use on the Mac and therefore makes it fairly similar to working on my Mac). I found the ability to portrait layout the iPad to be a nice change from working widescreen across (which I’ve found to be a pain sometimes on the smaller laptop screen – certainly it’s not so nice for displaying PDF documents which tend to be portrait aligned). I’m a big music fan (if you head over to my Last.fm page linked in the sidebar to the left), you’ll see that I’m a big fan of music (and Last.fm!). However, I only have the 16GB iPad and most of the used space on my iPad is used for apps. I have plenty of space for some music but not all of it. That’s where Audiogalaxy comes in. Install the help application on your home PC, set it find music and it’ll find it and stream it to your iPad or iPhone with the free app. No faffing with portforwarding or anything like that. It also supports on the fly Last.fm streaming so I don’t have to worry about connecting the iPad to iTunes to upload my listens! The app performed fantastically and also has a iTunes Genius style feature (called Genie…) that works fairly well. Browsing was done using either the Tapatalk app or using Mercury Browser which performs nicer than Safari and allows me to set the default search engine and looks more like Firefox or Safari on the Mac. Setting up, I was easily able to use it for a Skype conference call for a LSU Airsoft committee meeting where it performed fantastically. I also took some notes on a book, noting them down in Writing Kit so that they sync automatically to Dropbox, ready for me to use on the Mac. This point is somewhere where the iPad falls down. I take notes in Markdown and then I copy and paste the output Markdown into Evernote on the Mac. For some reason, Evernote doesn’t remember (and sync) the copy and paste formatting unless I copy and paste in from Chrome (and only Chrome). Also, I attach the Markdown file to the note in case I need to edit it at a later date – this I cant do on the iPad. Last thing before bed was to update my Day One journal. 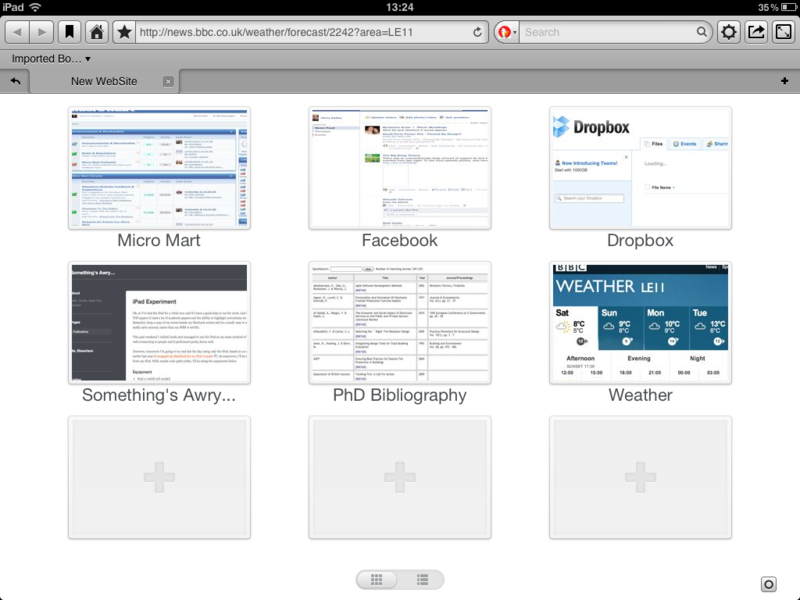 The easy sync between the iPad, Dropbox and my Mac means that it’ll remain in sync when I move back to the Mac tomorrow. Overall the day was fairly successful in using just the iPad. However, I should point out there were a few instances where I needed to VNC to my home PC to sort out some work – this demonstrates that the iPad isn’t suitable for replacing a laptop completely (as a researcher, I have to use data analysis tools as well which aren’t iPad compatible). However, as far as today went, the experiment went pretty well. It’s something I’ll be doing more often I think as I move from less research and more writing in regards to my thesis. The main problem I found was app switching – it would be nice to have an easy method of switching apps on the keyboard (such as ⌘ + Tab on the Mac). In the mean time, it was best to double press the home button the Logitech keyboard and select the app I wanted from the recently used apps bar along the bottom. A bit annoying as it means I have to take my hands off the keyboard to do so but not the end of the world. As far as the iPad goes, it’s not just a content consumer, it’s also incredibly productive. The instant on programs were great – something that some of the Mac programs could learn from!